Tonight’s the night, and it’s gonna happen again and again. It has to happen. An event that has grown so significantly in the short time since it’s inception that I would liken it to Beanie Babies or Furbies in the mid- to late-90’s. In other words, it’s blowing up like a balloon with a grenade in it, and it would be a shame if you missed it. You might be thinking, why are you just telling about it now then… I can’t go. I’ve already made plans! Well, cancel them because Recess 5 is set to be the best Recess yet. 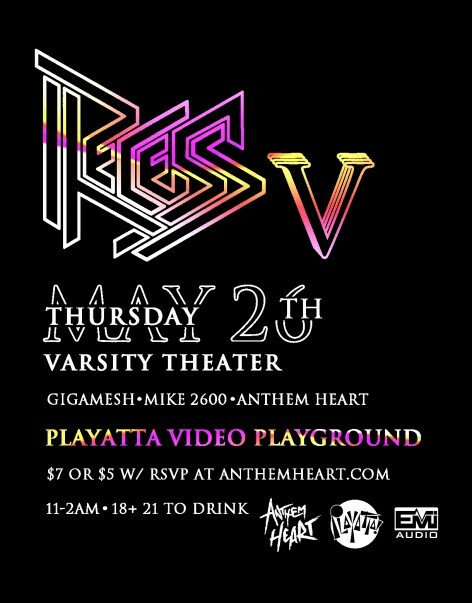 For just a $5 cover (if you RSVP at AnthemHeart.com, $7 if you are stupid and don’t) you get a “weekend worth of stimulation” packed into a “3-hour interactive exhibition of visual and sonic alchemy from the likes of Gigamesh, Playatta, Mike 2600, and Anthem Heart at the spectacular Varsity Theater. Seriously?! You’d be a fool not to go. So real quick: Tonight. Varsity Theather. $5 cover if you RSVP and $7 cover if you don’t. Event starts at 11 pm and ends at 2 am tomorrow. For more information check out the event page on Facebook. Drop a comment. Do it.